Woodfibre LNG: Whose side will Trudeau take? Woodfibre LNG: Whose side will Trudeau take? Sadly, we are not kidding. Premier Christy Clark desperately wants at least one “win” in the LNG arena, and this relatively low-output plant is low-hanging fruit. The clock is ticking, and to say that local residents are on the edge of their seats is an understatement. 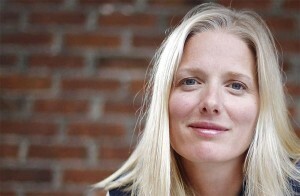 All eyes are on Canada’s Environment and Climate Change Minister, Catherine McKenna. This month at an event in North Vancouver she confirmed that this is ultimately a political decision, to be made by her and her cabinet colleagues. Whose side will McKenna take? In one corner we have rainforest destroyer and convicted tax evader Sukanto Tanoto – an Indonesian billionaire whose admitted purpose in proposing the Woodfibre project is to “give his daughter a company to oversee”. (I kid you not!) Behind Tanoto are provincial politicians Rich Coleman and Christy Clark, backing up another generous corporate donor against local constituents in an endless quest for a “win” on LNG. In the other corner, you have the people of Howe Sound and their local elected representatives. All eight municipalities and districts bordering the fjord formally oppose the project. During the provincial environmental assessment period, residents submitted 1,266 comments – the highest number ever in a B.C. project review – with 96 per cent opposed. 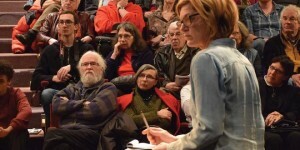 Liberal MP Pam Goldsmith Jones has since held three town hall meetings in the riding to hear from her constituents; in every case venues were filled to overflowing, consisting of literally hours and hours of citizens lining up to have their three minutes at the microphone. The number of comments in favour of the project in the three town halls could be counted on one hand. As residents pointed out, the economic benefits to the region will be minimal: a few dozen permanent jobs and negligible tax benefits from an offshore corporation already convicted of tax evasion. What’s more, Tanoto’s operations in the palm oil industry have left a legacy of wildlife and human rights violations. 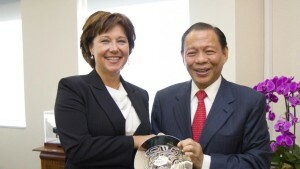 Is that who we want doing business in B.C.? 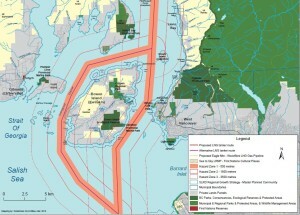 On the other side of the ledger, the environmental tradeoffs of the Woodfibre project are many: substantial air pollution, direct and upstream greenhouse gas emissions, destruction of herring spawning grounds by an outdated flow-through ocean water cooling system, and continual noise pollution, which disrupts dolphins and whales. Over it all sits the lunacy of siting an LNG plant with its (explosive) tanker traffic in a busy narrow waterway, which would be illegal under U.S. and international regulations. As Howe Sound locals wait to hear how their long and hard-fought battle will end, Canadians everywhere should be watching closely. Will the Trudeau government demonstrate the leadership we are hoping for – acting on science, in accordance with the promises we have made on climate? Will the Prime Minister side with our community? Or will the government ignore that lack of permission and give a permit to another reckless foreign resource company? The answer will have ripple effects right across British Columbia – from the Petronas LNG proposal on Lelu Island to Enbridge, Kinder Morgan, Fraser Surrey Docks and more. In the good old days governments were generally responsive to the concerns of their electorate. Christie and Rich run this province like the oligarchy that we have allowed it to become. Recall these petty dictators and turn this province back to a representative democracy . Trudeau will take the side of the corporations, because taking the resources out of this colony some of you call Canada, is what the European history of this place is all about. ‘Canada’ never stopped being a colony, it still wants ‘foreign investment’ to ‘help extract the resources’ that are not rightfully theirs to begin with: -Well that happens to be a perfect definition of colonialism. If it is still not clear, why does Canada still have a foreign monarch as its head of state. What more is there to say???? We should stop fooling ourselves and think that Canada is a free democracy with fari elections etc.a country that determines its own future. It can be, but enough people need to be on-side with the idea of decolonization, but as long as too many Canadians are more than happy in their complicit colonialism, simply in denial and/or to fearful to rock the status quo, nothing is going to change. I would be very surprised if the decision from the Federal Government is a NO to Woodfibre LNG. Pleasantly surprised, but still surprised. Wonderful blog, Cheryl. Describes the situation we face in Howe Sound so well. Love the pictures you have chosen to show the world where we live and how insane it would be to place an LNG plant and LNG supertankers here. Don’t forget that they plan to site the plant on an alluvial fan which sits over two thrust earthquake faults. They may now be inactive but seismologists cannot guarantee that they won’t be active in the future. Just one more risk for everyone to worry about. Anton – ‘Canada never stopped being a colony’ (of England??). Anton I’m sure that you’re not from around here and so can be forgiven for thinking that because Canada is not a republic like the U.S. that somehow this equates to us taking our marching orders from the Queen? Trust me Anton, it just ain’t so! Much more possibly we take too many orders from big brother to the south but definitely not the Queen! To Cheryl who authored the article, nicely written and I too love the picturesqueness of Howe Sound but I challenge you to research your facts on how explosive LNG actually is (not very). And in the unlikely scenario that there should ever be an incident at sea – the LNG bleeds off into the atmosphere instead of fouling the water and shoreline). 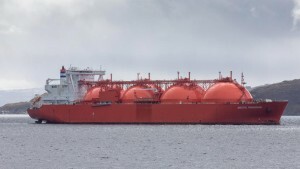 To my fellow Canadians who live on the ‘Left Coast’ – that you would choose to block an LNG port that would be exporting your very own natural gas is the most amazing example of NIMBYism I have witnessed in many years. I understand (sort of) your reluctance to let Alberta oil travel through your province given how little it directly benefits you (we won’t mention Alberta’s past contribution to Federal Equalization Payments or the ten’s of thousands of jobs filled by workers from every part of Canada or all of the out of province manufacturing that supports the energy industry). You have no moral qualm with all sorts of rusting ’60’s’ era tankers plying the pristine waters of the Maritimes and up the sensitive St. Lawrence Seaway bringing in crude oil from countries who sponsor world terrorism, ascribe women less human rights than some animals and throw gays off of rooftops but you won’t let state of the art, double hulled tankers and pipelines sell made in Canada commodity from your coastline even though in the last 60 years of Kinder Morgan there has never been a noteworthy incident. It’s more so that when confronted with the actual source of the dirty oil that you burn in your SUV’s, jetliners and seadoos that you just can’t stomach it! I suppose if we put up a toll booth on the Coquihalla and charged a tariff on all goods unloaded on your docks and entering Alberta to get to the ROC you would feel quite put out with Alberta’s mean spiritness and lack of provincial cooperation. NOW – having said that – I too am appalled by third world despot billionaires coming in and taking ownership of our resource infrastructure. Surely as a country we have matured to the point where some made-in-Canada entrepreneurship can step up to the plate for a change? Thank you for your thorough response Lowell. I am not at all an authority on the physics and chemistry of super-cooled and pressurized LNG, so I take my information from those who have PHD’s in these subjects. Suffice it to say that internationally recognized regulations for siting LNG plants, and for LNG tanker traffic, if B.C. were interested in subscribing to them, would definitely preclude a plant from being built at the Woodfibre site. Long, narrow channels are specifically listed as not safe, as are waterways with ferry and other marine traffic, such as we have in Horseshoe Bay. Dogwood is a B.C.-based group, and I will not offer comment on the transport of oil in other parts of the country. Rather, let me simply say this. Please take the time to refer to a New York Times this weekend : nyti.ms/1RcooKq, which is one of many regarding the speed at which climate change is happening on our planet. Stop to consider whether this is the time to embark on an expansion of a fracking-based gas export industry. Woodfibre is a risky location for a liquefaction plant, and LNG is a ludicrous industry to be launched by our province and our country at a time when we must be moving swiftly to a low-carbon economy. I’m trying to wrap my mind around how you would think that Canadian LNG exports are a good idea. How is the LNG going to be extracted? Fracking? (There is more and more proof that fracking can cause earthquakes.) How does it seem smart or logical to export it to China and other parts of Asia Canada’s extractive resources, so that China can own and further refine Canadian and U.S. resources, and sell them back to the US and Canada at top dollar – plus send us their air pollution from burning this stuff? (this is compounded by raw bitumen sands oil, coal, and other extractive products such as xylene being exported to China, and larger and larger export terminals and ships are used in narrow inlets with treacherous waters and currents. Why are we selling it to China anyway!? How can this seem like common sense and wisdom to you? – to transport, load, and run panamax ships off a coast that has many hundreds of narrow waterways and is in the Ring of Fire and this area is due for “the big one” – a 9+ on the richter scale seems like insanity to me. How is it OK to site a LNG facility in Howe Sound? How does this seem like a reasonable plan by any stretch of the imagination? Unless, of course, you work for or are a spokesperson for extraction industries and are buying the bait propaganda put out by extraction industry? Your argument about Kinder Morgan doesn’t fly. They actually have a terrible record – and it is not known WHAT sands oil will do to a pipeline in terms of corrosion – but it will be much worse, much sooner. Why not leave the bitumen in the ground or at least refine it in Canada and then send the FINISHED refined product to China, thus making a lot more money for Canada? But no. What we want is to stop this madness so there will be something left for future generations. Thank you for your inquiry – we would love to be able to offer our website in different languages and hope to be in a position to do so in the future. Unfortunately, the resources it would take to offer multi-lingual communications are at this time beyond our scope. Thank you for your patience! Things like this is exactly why we can’t allow the TTP to go through!!! Foreign investors, supported by Canadians (government, big business, or otherwise) in the development of our land will be able to sue the government if there happens to be one of our laws in the way of their progress! Thank you for expressing your concern about trade agreements such as the TPP, Chelsea. I urge you to write to your MP and let her/him know what your priorities are, and your concern that such agreements can impact our ability to protect our air, land and water.